It’s never been easy to tell whether that guy you can’t stop thinking about feels the same way about you. Here we are in 2016 and modern communication has made it even more complicated - Emojis, instant messaging and social media make it tricky to read a guy’s signals. Fear not! 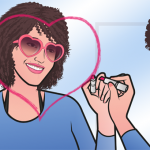 Read this and you’ll be well-equipped to crack the codes of 21st-century attraction. They say that every guy has a few “pantomimes”, signs that he likes you – or not. The problem is that modern communication is now so out of control that it’s really hard to work out what these “tells” are anymore. You often can’t see him face to face, which means you have fewer clues to go off. If he ‘likes’ your Facebook status, is he trying to tell you that he likes you via coded language? After all, why else would he care that you’ve just bought some peppermint essential oil? And what the frig does it mean when he sends you an eggplant emoji? What is the deal with that?! Many of us rely on automatic responses to get us through life. If we are faced with a decision to make, we rely on our fixed behavior patterns to help us make a rapid choice. It’s much more efficient than spending hours and hours weighing up all the pros and cons. If we’re thirsty, and faced with a choice between our favorite soda pop and something new, eight times out of ten we’ll go with the soda. It’s the shortcut choice. When it comes to talking to guys, though, we deliberate more than usual. We just cannot decide if he likes us or not, and we spend most of our time second-guessing things and analyzing his texts until 4am. Trying to figure out whether or not a guy is interested is like trying to crack the unbreakable code. In other words, it’s insanely hard. It’s okay for you to initiate a text conversation for the first few days. You want to talk to him and it’s all chill and fun. You always text first, but it doesn’t bother you because he’s clearly interested in talking. Otherwise, he wouldn’t bother to respond. And who cares if he doesn’t text first? He’s busier than you and maybe even a bit shy. Then after a while of texting first all the time, doubts can start to creep in and you wonder why he never initiates a conversation. Is it because he doesn’t really want to talk to you and only replies because it’s polite? If a guy likes you, he’ll look for any excuse to talk. If you haven’t texted for a while, he’ll initiate things with something as simple as a “hey” or as wildly imaginative as a funny story about something that happened to him. So you don’t text for a while and what happens next is crucial. If he sends a text a few days later wondering where you are, it might mean that he likes you. But it could also mean that he’s just worried about you. It’s really the vibes that you get from the ensuing conversation that will tell you whether or not he actually digs you. Some guys are natural born flirts. They literally can’t help themselves, even if they have a girlfriend they love. But most guys aren’t. In fact, flirting is a lot of work for a lot of guys. 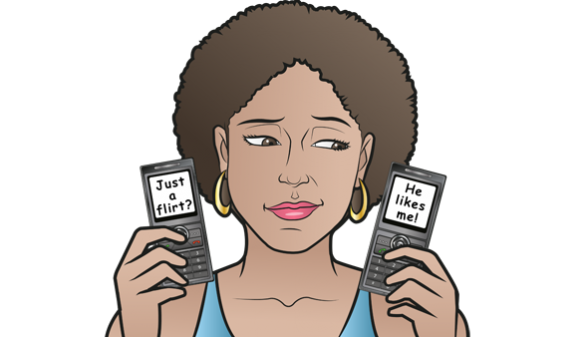 So…if a guy is constantly flirting with you via text, telling jokes, making you laugh, and teasing you, it’s a surefire sign that he feels at ease texting you and enjoys having a giggle. And, yes, there is a strong chance that he “fancies the pants off you”. Unpredictable people can be really frustrating in the sense that you never know what their next move is going to be. Moreover, because they’re so ambiguous, it’s hard to tell what they’re really thinking. A guy who likes you probably isn’t always going to be predictable. Instead, he’s going to do things that keep you on your toes and keep you guessing. Maybe one day he’ll suddenly add you to LinkedIn, totally out of the blue. Perhaps he’ll surprise you at 7:30 am with a funny .gif before you go to work. Maybe he’ll disappear all day, and then turn up at 10 pm with a wonderful text that tells you all about his day, and explains why he’s been missing. People are often unpredictable like this via text and social media when they live really busy lives. They don’t always remember to reply to your DM on Twitter, but get back to you at midnight on Facebook instead. You don’t know what he’s going to do next, but the fact that he’s putting in the effort to include you among his busy schedule is a clear sign he likes you. Out of creative text message ideas?  Sign up for our free 30 day texting club with over 300 messages.